Use about 2 quarts 3% hydrogen peroxide to a tub of warm water. Soak at least 1/2 hour, adding hot water as needed to maintain a comfortable water temperature. To cure a foot fungus, simply spray a 50/50 mixture of hydrogen peroxide and water on them (especially the toes) every night and let dry. Add 2 capfuls of 3% hydrogen peroxide in warm distilled water once or twice a week to remove even chronic yeast infections. For a colonic, add 1 cup (8 ozs.) 3% H202 to 5 gallons warm water. (Do not exceed this amount) For an enema, add 1 tablespoon of 3% H202 to a quart of warm distilled water. Soak any infections or cuts in 3% for five to ten minutes several times a day. Even gangrene that would not heal with any medicine has been healed by soaking in hydrogen peroxide. Put half a bottle of hydrogen peroxide in your bath to help rid boils, fungus or other skin infections. Patients infected by tiny mites report that hydrogen peroxide effectively kills the mites on their skins. They spray it on their skin a couple of times (with a few minutes in between the applications) with amazing results. A tablespoon of 3% hydrogen peroxide added to 1 cup of non-chlorinated water can be used as a nasal spray. Depending on the degree of sinus involvement, one will have to adjust the amount of peroxide used. 3% H2O2 is used medically for cleaning wounds, removing dead tissue, and as an oral debriding agent. Peroxide stops slow (small vessel) wound bleeding/oozing, as well. Some sources recommend soaking infections or cuts for five to ten minutes several times a day. However, washing and rinsing action is sufficient. You shouldn’t leave the solution on open tissue for extended periods of time as, like many oxidative antiseptics, hydrogen peroxide causes mild damage to tissue in open wounds. Therefore it is important to use with caution. Healing Properties: Take one capful (the little white cap that comes with the bottle) and hold in your mouth for 10 minutes daily, then spit it out. You will not have canker sores and your teeth will be whiter. If you have a terrible toothache and cannot get to a dentist right away, put a capful of 3% hydrogen peroxide into your mouth and hold it for 10 minutes several times a day. The pain will lessen greatly. Personal Note: I would be careful with this and any of the other tips where you are using H2O2 in your mouth, as it may damage tooth enamel. Many people don’t realize that hydrogen peroxide makes a very effective and inexpensive mouthwash. Use a mixture of equal parts 3% H202 and water – add a dash of liquid chlorophyll for flavoring, if desired. Use baking soda and add enough 3% H202 to make a paste. You can also add some crystal salt. Or, just dip your brush in 3% H202 and brush. Soak your toothbrush in hydrogen peroxide to keep them free of germs. 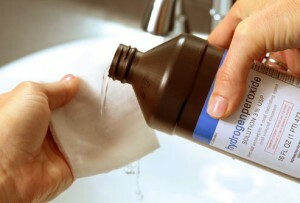 Hydrogen peroxide is not a pain killer; however, as an anti-viral, antibacterial and anti-fungal agent, it is effective at treating the pathogen that is causing the infection. The following is from my own personal experience: My dentist wanted to give me a root canal some time ago as one tooth was inflamed and, in her opinion, would die. I felt some discomfort but told her that I would give it a chance to heal. I rinsed with hydrogen peroxide (several times a day) as well as coconut oil (once a day). The discomfort went away and I have had no further problems with the tooth. Having used 3% hydrogen peroxide as a mouth wash for sometime ago, I am thrilled to note that my teeth have been beautifully and effortlessly whitened. I used to pay so much for professional whitening, those silly strips and uncomfortable trays. Live and learn. NOTE: Do not swallow any peroxide. When the peroxide rinse is done, be sure to rinse out your mouth with water. Peroxide is a bleaching agent and is used for lightened hair. Dilute 3% hydrogen peroxide with water (50 / 50) and spray the solution on your wet hair after a shower and comb it through. You will not have the peroxide burnt blonde hair like the hair dye packages, but more natural highlights if your hair is a light brown or dirty blonde. It also lightens gradually so it’s not a drastic change. Hydrogen peroxide is used as a disinfectant in CIBA Vision’s Clear Care no rub contact lens cleaning solution, due to its ability to break down the proteins that build up on the lens from the eye’s immune response, resulting in increased comfort for those with sensitive eyes. Clean your counters and table tops with hydrogen peroxide to kill germs and leave a fresh smell. Simply put a little on your dishrag when you wipe, or spray it on the counters. Use hydrogen peroxide to clean glass and mirrors with no smearing. Keep a spray bottle of 3% (straight) to disinfect the interior of the refrigerator and kids’ school lunch boxes. Add 2 oz. of 3% hydrogen peroxide to your regular washing formula. Fill a spray bottle with a 50/50 mixture of 3% hydrogen peroxide and water and keep it in every bathroom to disinfect without harming your septic system like bleach or most other disinfectants will. After rinsing off your wooden cutting board, pour or spray hydrogen peroxide (and then vinegar) on it to kill salmonella and other bacteria. A combination of vinegar and hydrogen peroxide makes a cheap, effective and non-toxic disinfectant agent and is said to be more effective at killing pathogens than bleach. As it is non-toxic, you can use it to disinfect fruits and vegetables, as well as pet toys, equipment and cages. In tests run at Virginia Polytechnic Institute and State University, pairing vinegar and hydrogen peroxide mists, kills virtually all Salmonella, Shigella, or E. coli bacteria on heavily contaminated food and surfaces. You need TWO spray bottles. DO NOT MIX the solutions together. Put straight vinegar in one and straight Hydrogen peroxide in the other spray bottle. NOTE: Light destroys peroxide rather quickly. It’s best to leave it in its original bottle and screw in a spray head. DO NOT DILUTE THEM. Remember for any sanitizer to work properly, the surface has to be clean before you use it. When you want to sanitize a surface (vegetables, cutting board, counters, sink, cages, toys. toilets, floors, etc. ), spray one (it doesn’t matter which one you use first) on the surface, then you spray on the other. When they mix, for a brief time the chemical action of the two make a very powerful sanitizer. You can rinse off the surface afterwards, if you want, but the result is non-toxic. Clean with hydrogen peroxide when your house becomes a bio-hazard after its invaded by toxic mold, such as those with water damage. Use 1 pint 3% hydrogen peroxide to 1 gallon of water. 3% hydrogen peroxide is the best stain lifter if used fairly soon – although blood stains as old as 2 days have been successfully lifted with hydrogen peroxide, although it will bleach or discolor many fabrics. If a little peroxide is poured onto the stain, it will bubble up in the area of the blood, due to a reaction with catalase. After a few minutes the excess liquid can be wiped up with a cloth or paper towel and the stain will be gone. 3% H2O2 must be applied to clothing before blood stains can be accidentally “set” with heated water. Cold water and soap are then used to remove the peroxide treated blood. You can also add a cup of hydrogen peroxide instead of bleach to a load of whites in your laundry to whiten them. If there is blood on clothing, pour directly on the soiled spot. Let it sit for a minute, then rub it and rinse with cold water. Repeat if necessary. Peroxide is a perfect alternate solution to keep those clothes white. Also, when chlorinating clothes, they tend to wear out faster – peroxide won’t do that. Use as a vegetable wash or soak to kill bacteria and neutralize chemicals. Add 1/4 cup 3% H202 to a full sink of cold water. Soak light skinned (light lettuce) 20 minutes, thicker skinned (like cucumbers) 30 minutes. Drain, dry and refrigerate. Prolongs freshness. If time is a problem, spray vegetables (and fruits) with a solution of 3%. Let stand for a few minutes, rinse and dry. You can also use it to rinse off your meat before cooking. Spray with a solution of 1/2 cup water and 1 Tbsp. 5%. Drain, cover and refrigerate. Place meat, fish or poultry in a casserole (avoid using aluminium pans). Cover with a dilute solution of equal parts of water and 3% H202. Place loosely covered in refrigerator for 1/2 hour. Rinse and cook. Add 1 ounce 3% hydrogen peroxide to 1 pint of water and soak the seeds overnight. Add the same amount of hydrogen peroxide each time you rinse the seeds. You can also use a mixture of 1 part hydrogen peroxide to 32 parts water to improve your plants’ root system. A) 3.5% Pharmaceutical Grade: This is the grade sold at your local drugstore or supermarket. This product is not recommended for internal use. It contains an assortment of stabilizers which shouldn’t be ingested. Various stabilizers include acetanilide, phenol, sodium stanate and tertrasodium phosphate. F) 35% Food Grade: This is used in the production of foods like cheese, eggs, and whey-containing products. It is also sprayed on the foil lining of aseptic packages containing fruit juices and milk products. THIS IS THE ONLY GRADE RECOMMENDED FOR INTERNAL USE. Only 35% Food Grade hydrogen peroxide is recommended for internal use. At this concentration, however, hydrogen peroxide is a very strong oxidizer and if not diluted, it can be extremely dangerous or even fatal. Any concentrations over 10% can cause neurological reactions and damage to the upper gastrointestinal tract. There have been two known fatalities in children who ingested 27% and 40% concentrations of H202. Another report tells of a 26 month old female who swallowed one mouthful of 35% H202. She immediately began vomiting, followed by fainting and respiratory arrest. Fortunately, she was under emergency room care and although she experienced erosion and bleeding of the stomach and esophagus, she survived the incident. When she was re-examined 12 days later, the areas involved had healed (J Toxicol Clin Toxicol 90;28(1):95-100). Personal note: As with ANY food, drug, or supplement, using the product according to instructions is key to safety. If someone uses too much, then of course ramifications may be felt. We’ve NEVER heard of ANY harmful side effects from the correct usage of Food Grade hydrogen peroxide. 35% Food Grade H202 must be…. 1. Handled carefully (direct contact will burn the skin- immediate flushing with water is recommended). 2. Diluted properly before use. 3. Stored safely and properly (after making a dilution the remainder should be stored tightly sealed in the freezer). One of the most convenient methods of dispensing 35% H202 is from a small glass eye dropper bottle. These can be purchased at your local drugstore. Fill this with the 35% H202 and store the larger container in the freezer compartment of your refrigerator until more is needed. Store the eye dropper bottle in the refrigerator. The drops are mixed with either 6 to 8 ounces of distilled water, juice, aloe vera juice or gel. Here’s more about this “miracle in a bottle” ……. Use for towels that have become musty smelling. Combine 1/2 cup peroxide and 1/2 cup vinegar and let stand for 15 minutes, then wash as normal. Gets rid of the smell. De-skunking solution: Combine 1 quart 3% H2O2, 1/4 cup baking soda, 1 teaspoon Dawn dish detergent, 2 quarts warm water. Clean your sponges: Soak them for 10 minutes in a 50/50 mixture of hydrogen peroxide and warm water in a shallow dish. Rinse the sponges thoroughly afterward. Whiten bathtub grout: First dry the tub thoroughly, then spray it liberally with hydrogen peroxide. Let it sit (it may bubble slightly) for a little while, then come back and scrub the grout with an old toothbrush. You may have to repeat the process a few times. Clean the toilet bowl: Pour half a cup of hydrogen peroxide into the toilet bowl, let stand for 20 minutes, then scrub clean. Brighten dingy floors: Combine half a cup of hydrogen peroxide with one gallon of hot water, then go to town on your flooring. Because it’s so mild, it’s safe for any floor type, and there’s no need to rinse. Clean kids’ toys and play areas: Hydrogen peroxide is a safe cleaner to use around kids, or anyone with respiratory problems because it’s not a lung irritant. Spray toys, toy boxes, doorknobs, and anything else your kids touch on a regular basis. Help out your plants:To ward off fungus, add a little hydrogen peroxide to your spray bottle the next time you’re spritzing plants. Remove yellowing from lace curtains or tablecloths: Fill a sink with cold water and a 2 cups of 3% hydrogen peroxide. Soak for at least an hour, rinse in cold water and air dry. Use it to remove ear wax. Use a solution of 3% with olive or almond oil. Add a couple drops of oil first then H2O2. After a few minutes, tilt head to remove solution and wax. Can also be used for swimmer’s ear. Hydrogen peroxide could really be called oxygen water, since it is basically the same chemical make up as water but with an extra oxygen atom (H2O2). Because of this, it breaks down quickly and harmlessly into oxygen and water. Hydrogen peroxide has a very simple composition: just water and oxygen. However, its potency lies in its simplicity: it is a powerful antiseptic and can destroy a variety of pathogens through the process of oxidation. The key to success with this home remedy is the timing. You must get the peroxide in the ear canal at the very first sign of illness for it to be effective. Miss the window and you will most likely suffer the full bout of the virus. The theory behind the peroxide protocol came from Richard Simmons M.D., who hypothesized that colds and flu viruses enter the body through the ear canal, not the nose and throat. 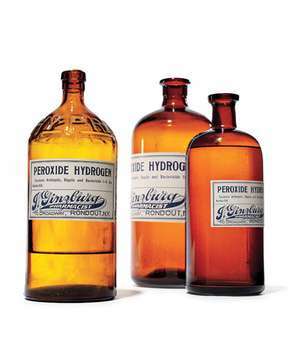 Like most other non-patentable therapies, the medical community at large ignored the hypothesis and the effectiveness of hydrogen peroxide. In 1938 German researchers used hydrogen peroxide to treat colds and flu with much success, but their research has also been all but ignored. However, even the Centers for Disease Control and Prevention (CDC) recognizes the effectiveness of hydrogen peroxide to kill influenza viruses. Do you have a use for H2O2 not mentioned here? Please share in the comment section so that other people can benefit. p.s. Be sure to give Self-help Health a follow, so you don’t miss out on future posts. And check out the To Your Health page of my website Evolution Made Easier and my other blog for more helpful information, tips, tools and resources. Disclaimer: Please note that any information provided here is as a guideline only, and not meant to substitute for the advice of your physician, nutritionist, trained healthcare practitioner and/or inner guidance system. Always consult a professional before undertaking any change to your normal health routine. Sinus Congestion, TMJ, Toothache, Eye Irritation? Acupressure Points St 3 & St 6 To The Rescue! More Acupressure Points, Alzheimer’s & Dementia Summit, Health Coaching Webinar AND A Beauty Tip! WOW– needed to read this, and I need to buy more of it, too. Thanks!!! So glad you found it helpful. Actually one reason I did the post was so I’d always know where to find the list of uses myself. 🙂 I usually stock up on hydrogen peroxide when CVS, Walgreen’s, etc. have a sale. Sometimes I get the big bottles for as low as 88 cents each. I don’t think it was listed in the post, but I also use it as a drain opener when my bathroom sink starts to be slow emptying. Usually if I catch the slowdown earlier enough, pouring some peroxide down it a couple times does the trick.